With the murder of Julius Caesar on the Ides of March 44 BC, a new political constellation seized control of the city of Rome. Known as the Second Triumvirate, this alliance between Gaius Octavius (Augustus), Marc Antony, and Marcus Aemilius Lepidus formed in the year 43 BC and saw the three most powerful men in Rome overcome their own personal differences to bring about a new stability to their tumultuous city. 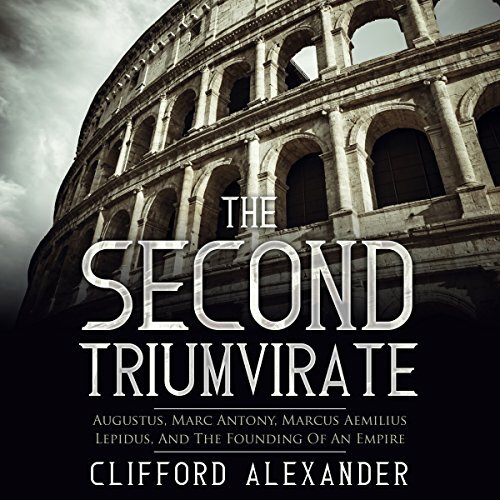 It was a period of extreme violence, as the Second Triumvirate first needed to contend with the rebellious conspirators who had first assassinated Caesar and then broken away from the Roman state. Gradually emerging victorious over the assassins, the Second Triumvirate attempted to consolidate their hold on the Roman Empire by partitioning its vast expanse amongst themselves. However, as Rome always proves true only one man can master the greatest empire of the Mediterranean. In what followed, political intrigue pitted each member of the Triumvirate against one another, as all attempted to seize absolute power. This contest between the greatest Roman politicians mobilized vast armies from across the world, and featured battles that stretched from the sands of the Persian heartlands to the Spanish steppes. From the ashes of the Second Triumvirate emerged a new form of government that we now know as the Empire. It was a form of governance that reflected the violence from which it was born. Cruel and absolute in their use of power, the Roman emperors could now dictate the course of the nation without having to bow to the desires of the people of Rome. Under their direction, Rome would be resplendent and glorious once more.